When Ramadan comes along, as parents we are often overwhelmed. What with the daily parenting tasks, we unfairly burden ourselves by thinking we have gained some superpowers during this month. We suddenly get the urge to juggle extra duties, cram in hours of worship, complete the Quran multiple times without breaking a sweat, host endless iftar parties, share food daily with the neighbours, AND instill the Ramadan spirit to our children, by doing zillion craft activities. These unrealistic goals will exhaust us and will teach our kids that Ramadan is something where we are stretched in all sorts of directions. Look at them, what do you want them to know about Ramadan? We shouldn’t guilt trip ourselves into being the Mary Poppins of Ramadan, because that’s what we think everyone else is doing. We can’t expect ourselves to do it all because that bubble will crash and burn pretty quick. It will leave us feeling empty, disappointed and not good enough. And the Ramadan spirit will slip away without having touched us. This Ramadan don’t get busy, get reflective. During Ramadan it is a constant struggle to keep kids entertained, while you don’t have much energy, and with the little energy you do have, wanting to do some Ibadah (worship) Time slips away and you feel like you haven’t done enough? You haven’t maximized your time. But educating your children and getting them excited about Ramadan is also an act of worship. Making kids understand why mom and dad are fasting along with Muslims all around the world, can be an eye opener into kids feeling part of something big. If you don’t have the energy to deal with the kids, other than the daily nag fest, all is not lost! Here are some easy ways to instill some Ramadan spirit into them, and let them benefit from this month, as much as you are, In sha Allah! After all, these childhood moments are the memories they will cherish in years to come, the Ramadan habits they will learn now, will build their own legacy with their future kids. If you want your kids to understand what you’re doing and who you are doing it for, you need to explain it to them, in simple terms. Not eating food or drinking for the whole day may seem scary, but letting them know that Allah (swt) does not do anything that harms us. Fasting is prescribed for us by Allah (swt) like a doctor prescribes us a course of medicine to heal us, it is for our own benefit. This should reassure kids, that Allah (swt) always has our best interests. Also teach them confidence, that what seems hard at first, actually gets easier as we build a habit. Kids may wonder why have these adults got themselves so worked up, what’s so special about Ramadan anyway? Tell them! don’t keep it a secret! 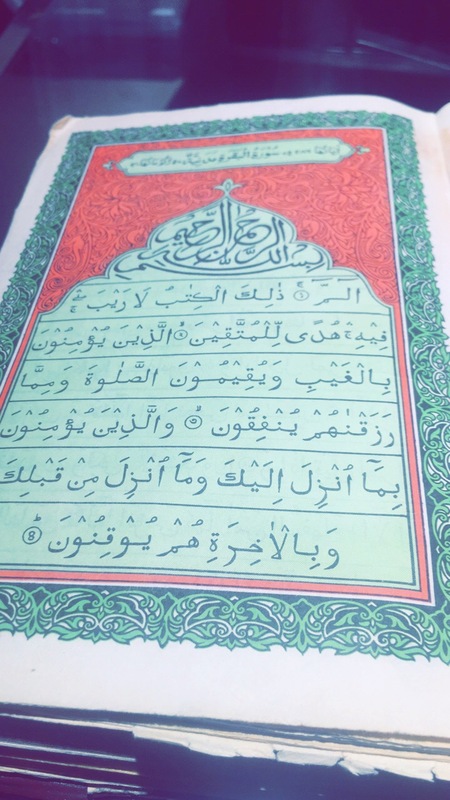 Ramadan is when the Quran was first revealed. Ramadan is when duas are readily accepted, the acts of worship and good deeds are multiplied in month of Ramadan. You get rewarded much easily in this month than any other time of year. 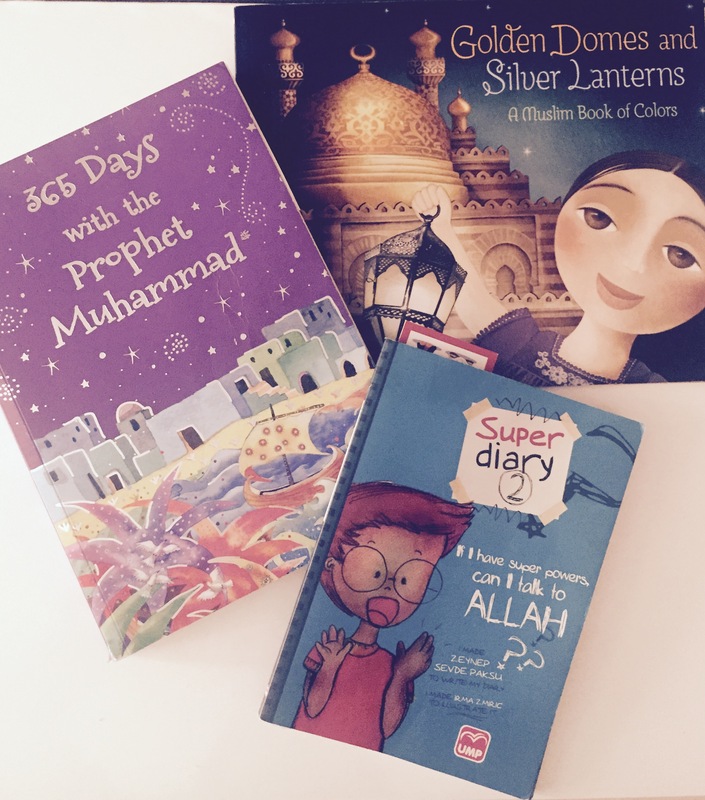 Read to them Ramadan stories so that they learn about Ramadan in a fun way. 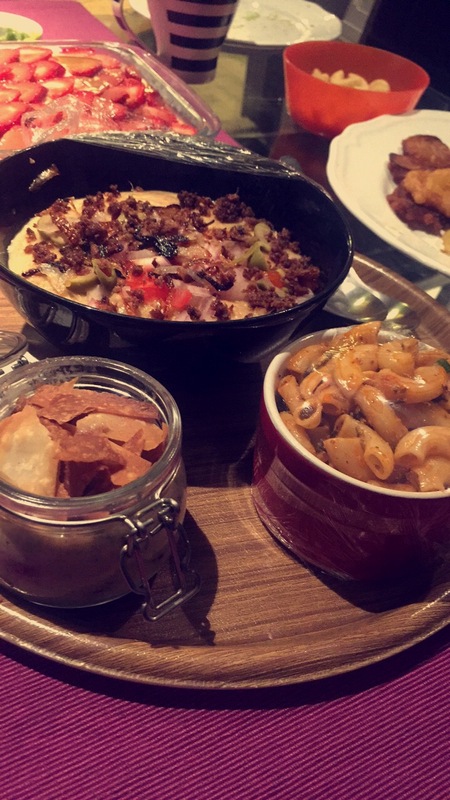 Share with them your own Ramadan memories. These are just some books that my kids love to reread again and again. There are so many more amazing books to choose from check them out here. If you are excited, your kids will also be excited, the buzz in the house will be infectious. Make this time a special time of year that they should always look forward to, and not dread. This whole month is something out of the ordinary, with many blessings in it, encourage kids to be the best that they can be, reaping multiple rewards, by showing exemplary behavior yourself. 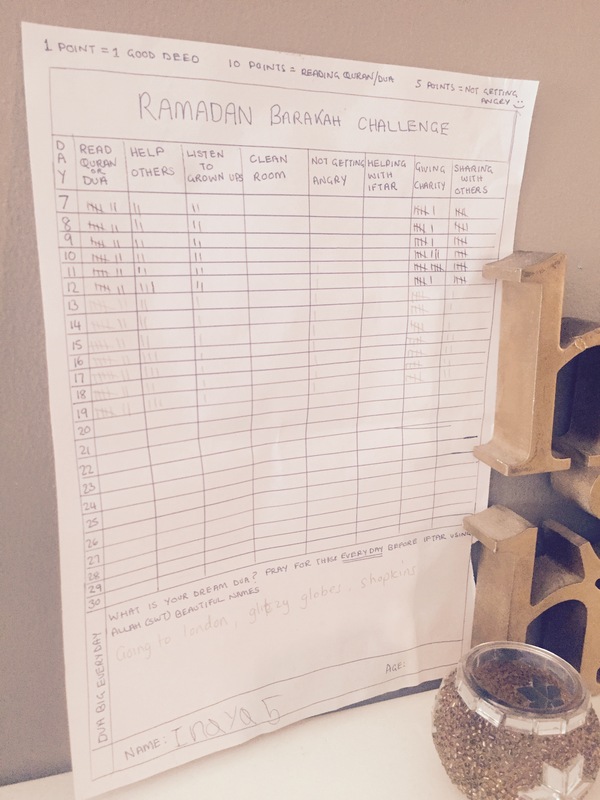 I made this Ramadan Barakah Challenge (see below) that has 30 new tasks for each day. 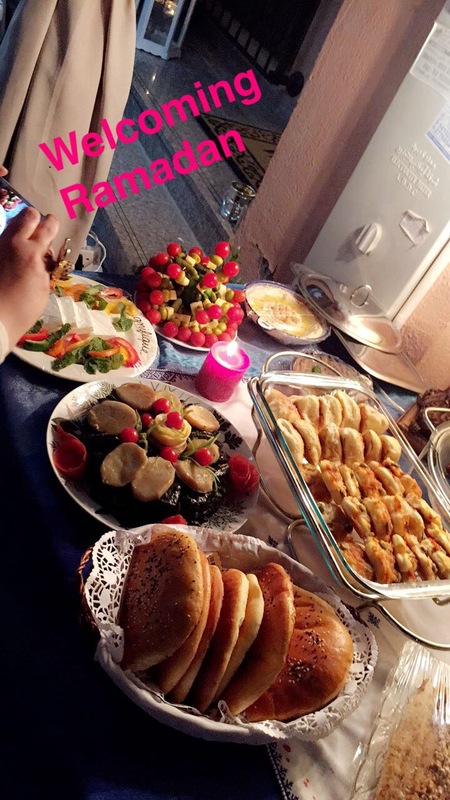 Little tasks such as prepare the iftar table, give five people hugs, take care of sibling, smile at ten people etc. If the kids complete their daily challenge they get 10 points added to their good deeds chart, and a treat at the end of the day. Every morning my girls (8 and 6 years old) run and check the task for the day, and knock it out if the park in the first five minutes of waking up! It’s so cute to witness ma sha Allah, they can’t wait to complete their tasks, and they love the excitement of doing the next one each day. 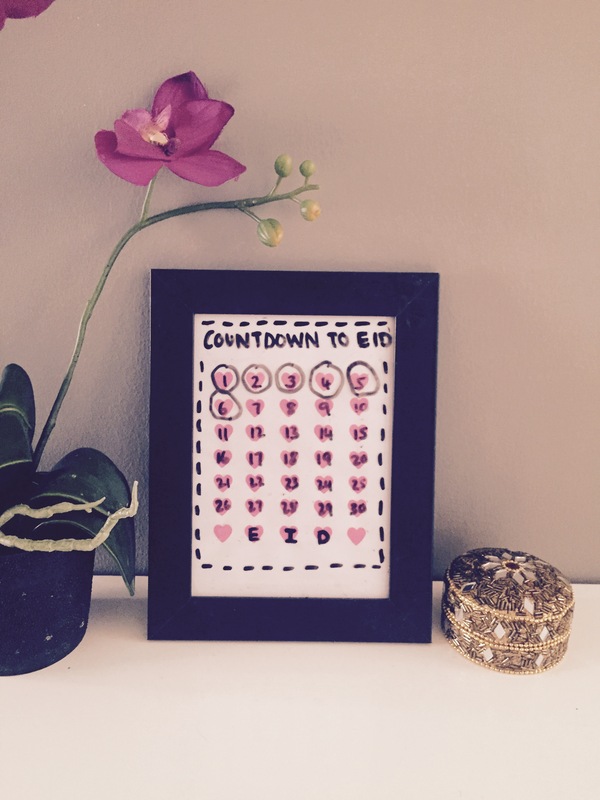 Another thing that keeps kids engaged everyday, with how many days have passed and how many are remaining, is this countdown to eid frame! All you need is a frame and a marker! Help your kids in making a dream dua that they can say every night, in the nights of Ramadan. The nights of Ramadan are just magical, let them feel the magic. Let them know that Allah answers every prayer. And if you aren’t doing this already, check out my previous post, Get what you want this Ramadan. This teaches kids from a very young age, that no matter what, they should always ask Allah (swt) for what they desire. Although mom and dad might be there, it’s Allah (swt) who provides and even if mom and dad say no, Allah (swt) may say yes! So tell them to Dua big ! Get them into the habit of talking to Allah (swt) this could be last thing at night before sleeping, where they are most reflective. Saying ‘I love you Allah’ and ‘thank you Allah’ for a fun day in simple terms teaches kids that Allah is accessible to everyone and in any language. It helps them into building a close relationship with Allah (swt) who is always looking over them while they sleep. DIY Kids good deeds chart with dream dua reminder at the bottom. Helps kids to keep focused and maximize opportunities for doing good deeds, and earn rewards given out on Eid. 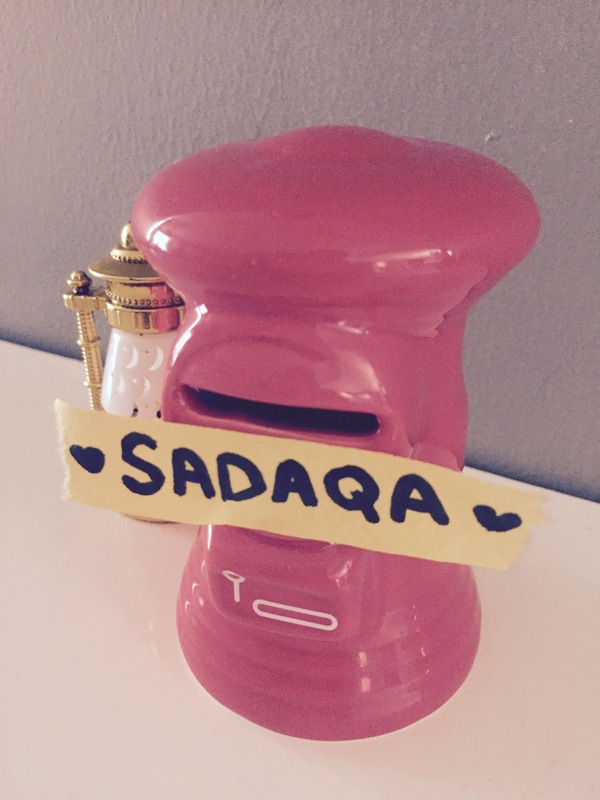 As a family (kids and adults) we usually compete to see how many good deeds, we can tally up by the end of Ramadan. Reading Quran gets maximum points, whilst not getting angry also scores highly. We suddenly have a calm household. Win win! 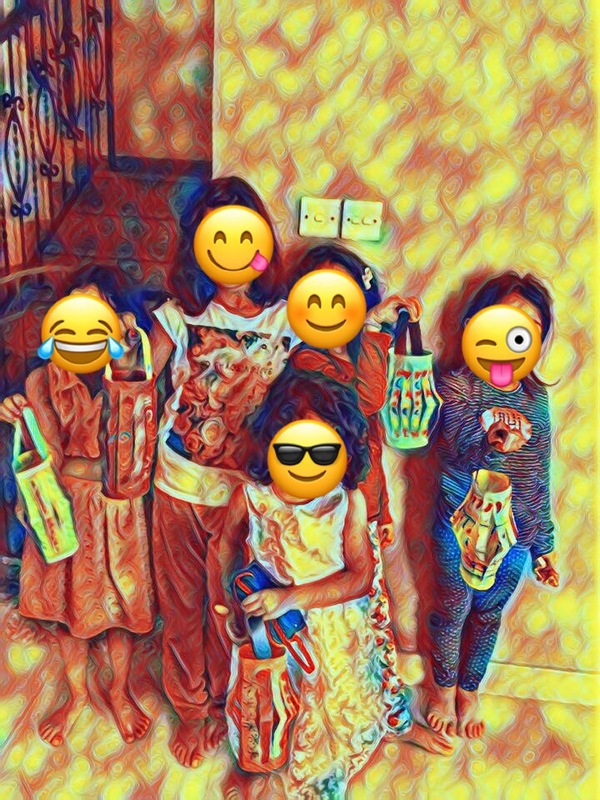 Usually during iftar times, kids are the last people on our minds, we just want them out the way, while we prepare a huge platter ready for adults to enjoy. This is a huge opportunity to instill some Ramadan buzz into the kids. Their senses are already heightened, because they have come to a different place for iftar, how about give them some colouring to do to keep them engaged, whilst learning about Islam. 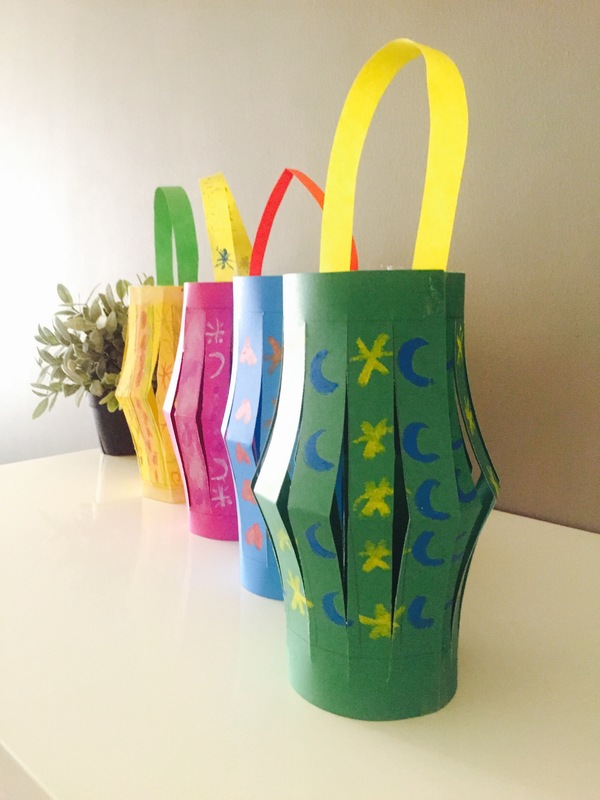 During an iftar party I had the guests make lanterns to take home with them. Here are some great sites you can get free printables for those days when you need some quiet time, or keeping kids entertained during iftar. 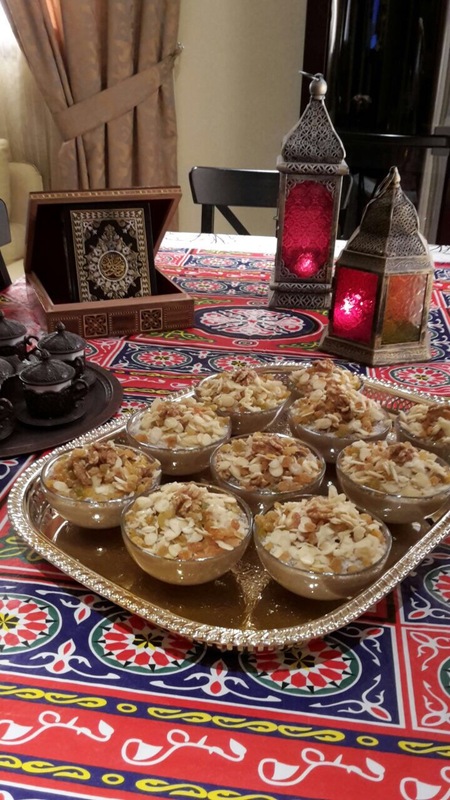 Get them to set up the iftar table and if it’s too late and way past their bedtime, how about involve them in making a dish for the family or neighbours. This way they can help in preparing, and not lose out in the reward of feeding those who are fasting. This could be simply filling up water bottles, preparing dates with nuts, baking cookies. Whatever it is let them contribute in a small way. Let them prepare food for neighbours and friends. We have awesome neighbours, who send over food, almost every day! This teaches the kids that whatever you have, it can be shared, even if it is yummy food that you like for yourself! My girls skip over just before sun down to deliver a plate of iftar couple of doors down. This encourages love for one another and community spirit during this blessed time. If you don’t have Muslim neighbours you could always leave some goodies for non Muslim neighbours. Kids need to know that neighbours are neighbours regardless of religion. Islam teaches us that our neighbours have rights over us. Teach kids the greatness of charity and sharing in this blessed month. Have the kids do deeds to collect coins and put in the charity box. They love the clinking of coins! Although they may not understand the value of money, they understand that whatever you give big or small it benefits someone in need. Kids prepare food bags for workers. 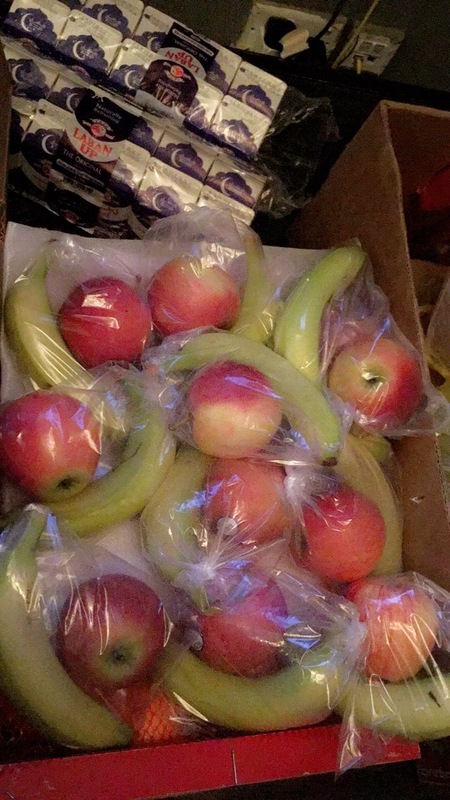 If you don’t have poor or homeless in your area you can prepare goody bags and give to passer bys with a Ramadan message or just Salam! This inspires kids, that even though as adults we are fasting and it’s tough and tempting handling food, we still want to make sure everyone gets fed. Ramadan Fridge. This is set up outside our villa every Ramadan. There are hundreds of Ramadan Sharing Fridges all over UAE find them on Instagram and Facebook to locate one near you. Even though the fridge is outside our villa, in the heat of 50 degrees plus , the girls fight over who will fill it up. Multiply the Barakah (blessing) by sharing out the chores. My kids have the habit of fighting over who does what. My lightbulb moment, was to tell them that by sharing out the deed they both get the reward, and it isn’t lessened! They love this and no longer squabble at who’s doing what and instead help each other in completing a task. If our view of Islam is , its ‘just a bunch of rules’ that were ‘just supposed to do’ e.g. Praying, fasting, listening to elders etc. Then we most likely won’t get the spiritual benefits of doing these acts. If we never allow ourselves to reflect on why and how these things benefit us and society, we haven’t allowed Islam to enter our hearts and effect us spiritually. If fasting and prayer and giving sadaqa (charity) isn’t giving you peace,or isn’t giving you contentment, and just feels like a burden of set rules you need to follow. Then know, you are disconnected with the teachings and so are not reaping any fruits of faith. You might be going through the steps but don’t you want to taste the sweetness of iman? Building a connection with Allah (swt) is a fundamental principle in Islam, and even if your iman (faith) is at a low point which is natural from time to time, this Taqwa (God consciousness) and Tawakul (Trust in God) will keep you from feeling completely lost. Help yourself first, and then help your children build a connection. Teach the benefits of praying on time, of having a daily exclusive appointment with Allah (swt). These acts of worship are only there to benefit us and society at large. It grounds us during turbulent times, keeps us in a routine which gives us peace, constantly reminding us of our higher purpose when everything else seems meaningless, this is the thing that gives all meaning. This is a golden opportunity for you to also reevaluate your own intentions, and remind yourself the true reasons why you are fasting, is it just a tick box every year ?Ramadan done, fasting done, or is it something that you truly look forward to, being reconnected to the global ummah, being closer to Allah (swt), being reflective of who you are and what you want to be. Express this desire of wanting to feel close to Allah (swt) always, throughout the month and year. Explain the concept of taqwa (God consciencness) to your children and wanting to please Him in your acts, which will be a life long lesson for your children. 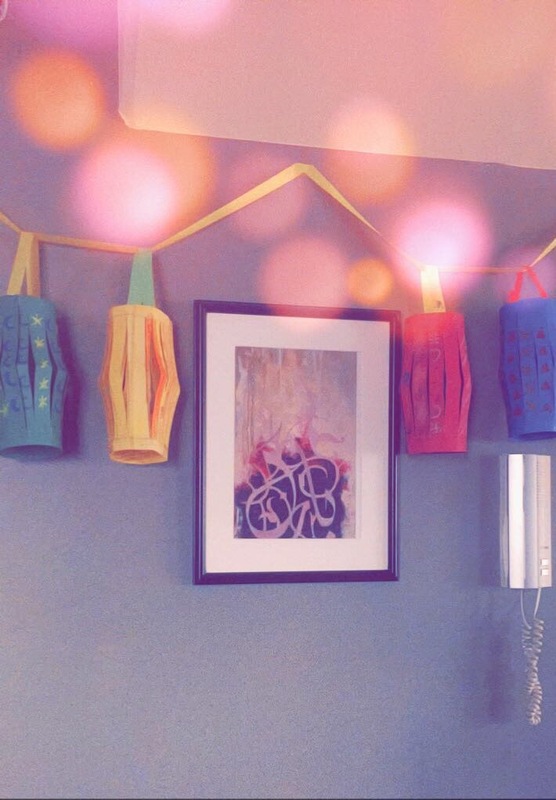 Let me know in the comments what you’ll be doing with your kids during Ramadan, and ways that you’ve been able to cope, whilst keeping the spiritual high. May the days of Ramadan go smoothly, and may we maximize our time and effort with all types of Ibadah, so that we reach the ranks of those that Allah (swt) is most pleased with. Ameen! Ive been trying to do much of what you’ve written. Getting them excited for this month has been most important to get their interest. My daughter is 4 years old and is really enjoying ramadan. I hope slowly we can teach them to be must better muslims than we are Inshallah. Thank you for stopping by! Yes we only pray that whatever small effort we make into teaching our kids, that they extend it further as they grow and learn in sha Allah. Your Ramadan posts are lovely! I love how you’re always so proactive especially with the kids. Not that I can relate, but it’s really interesting anyway! This is so informative! loved it, will be using a few of these techniques. This Ramadan don’t get busy, get reflective.- said it all! Such a beautiful one!! Sharing!! Such great tips! It’s important not to lose sight of the worship aspect of Ramadan in all the excitement, as you say. Such an informative post, and some great pointers to get the kids involved! 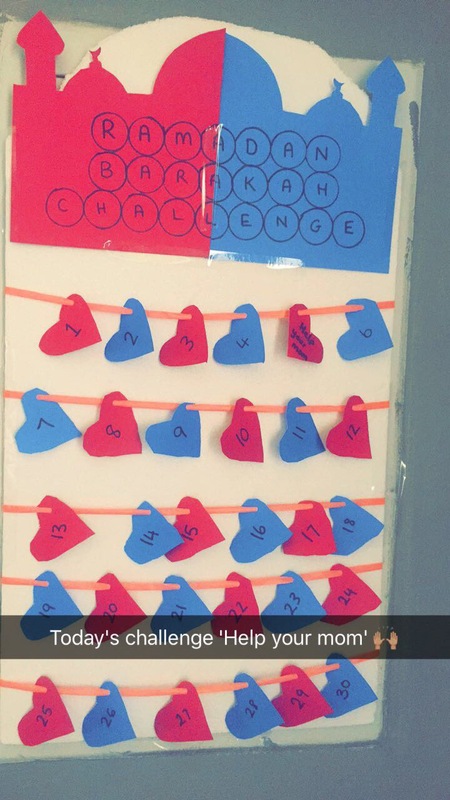 I esepecially love your hand made Barakah Challenge calendar! I love this post – so many great points to involve the kids and adults to remind themselves of. I think there is something for all age groups here! Thanks for sharing! Going to keep some ideas for my little one!